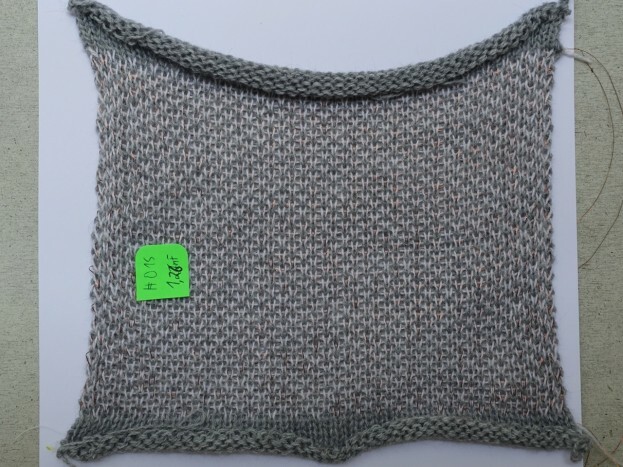 Do different patterns and materials affect the capacity of knitted capacitors and if so in which way? 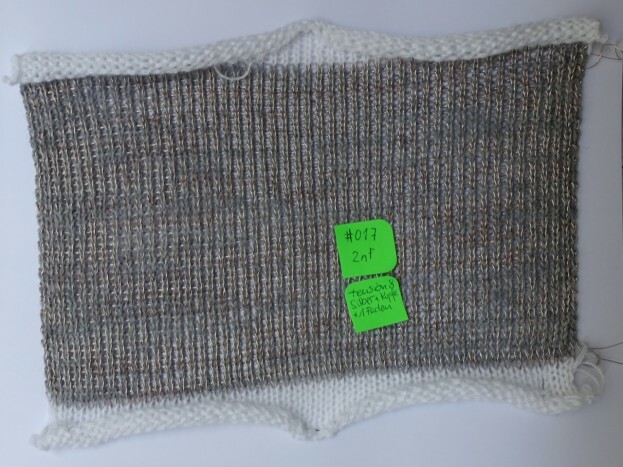 Various tests of knitted capacitors within the following frame conditions: The capacitors were knitted with an electronic knitting machine (Brother KH-930), the capacitor samples have a fixed size of 48 rows and 48 stitches. 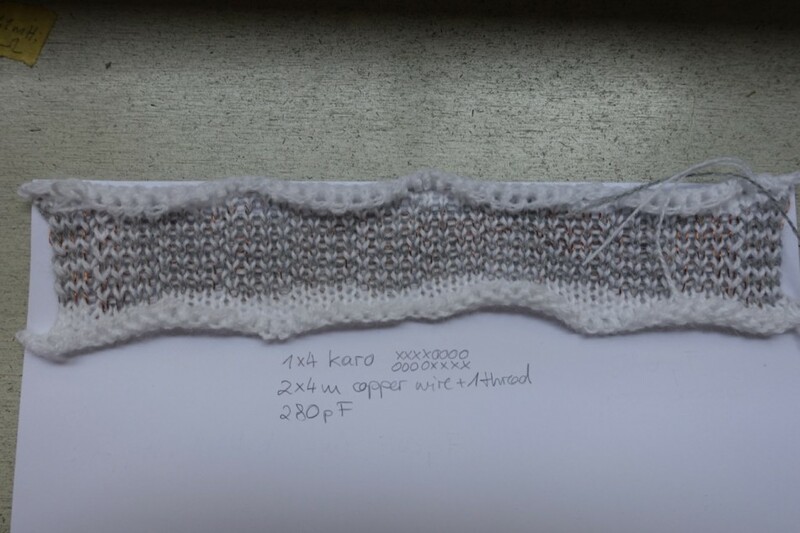 The materials used in the tests are the following: copper wire, silver thread (7×1 Karl Grimm) and normal/nonconductive (polyester/acrylic) thread. 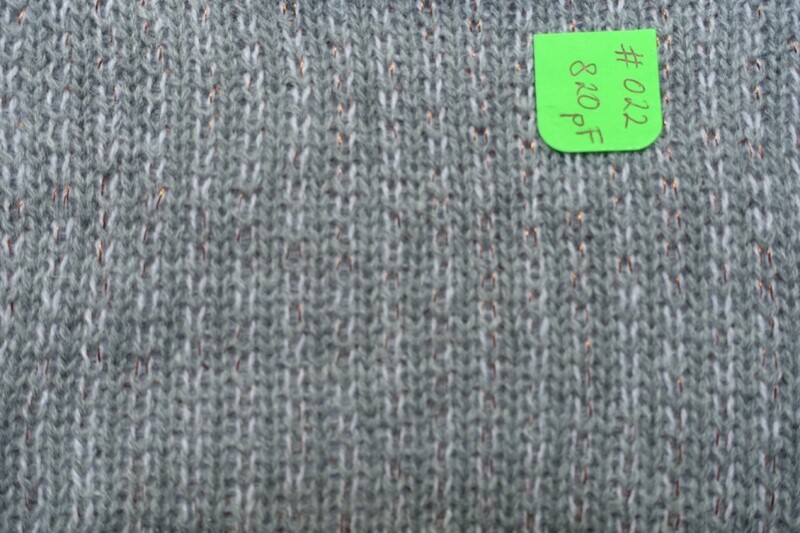 Measuring these two samples, it becomes clear that the pattern affects the capacity value. Assuming that the reason for the different capacity values is the difference in how tight the two copper wires are knitted together, the following two tests are conducted to test that assumption. 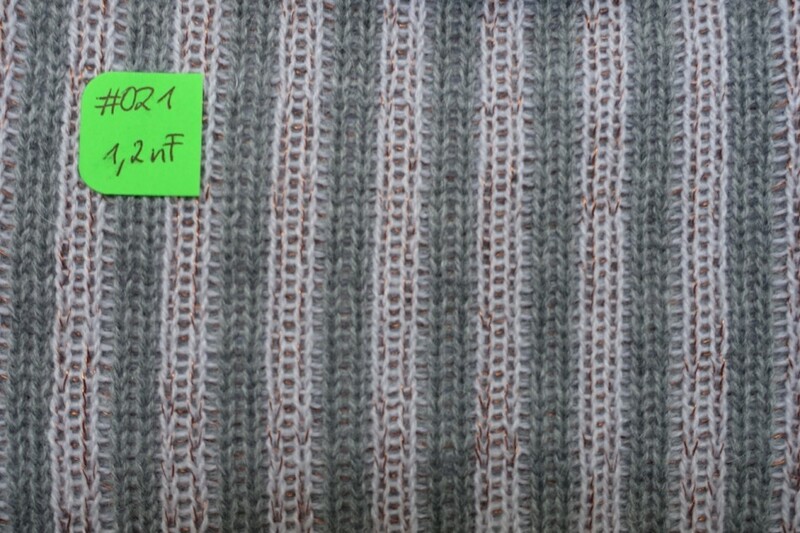 The patterns are similar to the one used in the previous tests, but every stitch/color is repeated. These patterns show no significant difference in the capacity values. Also, the capacity of #15 is stil higher. The tighter the wires are knitted together, the smaller the isolation between them and the higher the capacity. 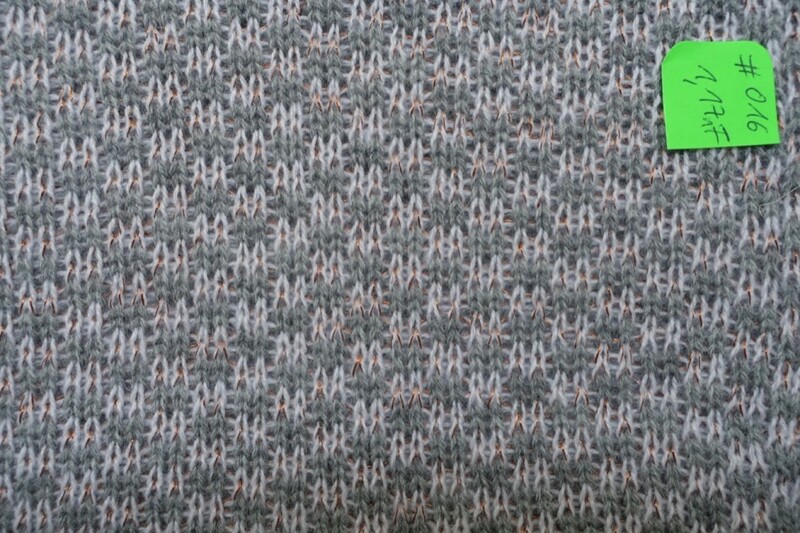 The longer the wires are lying on the back/left side of the fabric, the higher the capacity. In the next test, we tried out a pattern in which more stitches with wires are left out, so that the lines in the back get longer. The capacity is clearly smaller (about 820 pF). Assumed reason for the difference: less stitches with the copper wires, less conductive material. 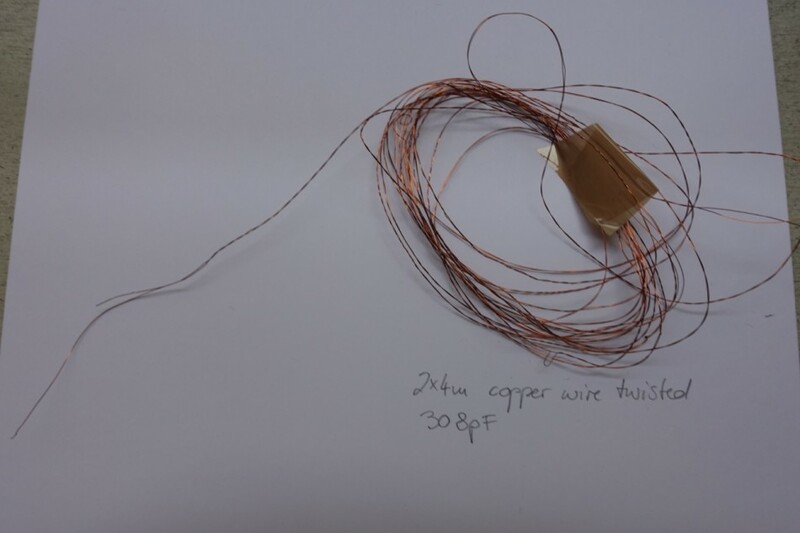 Based on the same amount of conductive material (4m of copper wire), we measured the capacity of twisted copper wires and two different patterns. The capacitor with two twisted copper wires has the higher capacity. 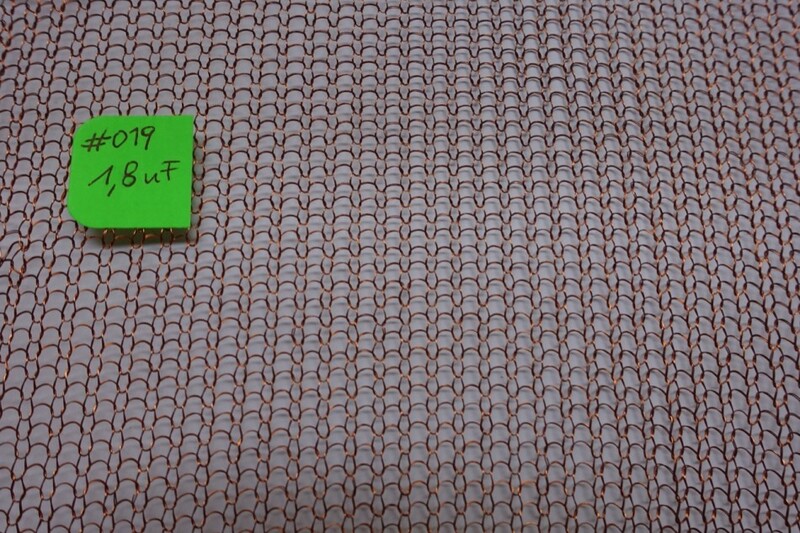 Also, longer/flat lying wires cause a better capacity, but on the other hand, it uses less less conductive material in the pattern. 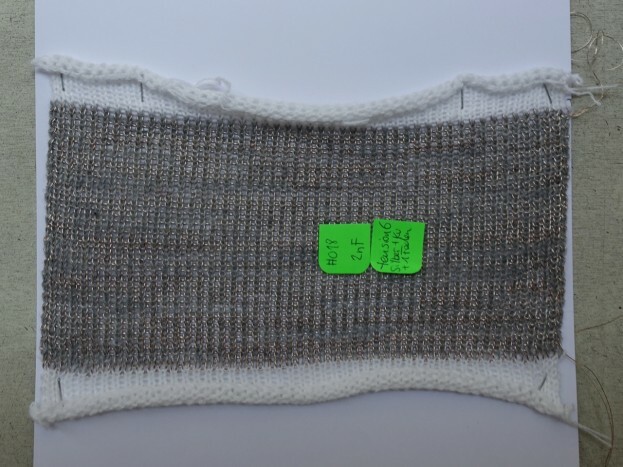 Trying to knit the wires tighter together and using as much conductive material as possible within the 48 rows and 48 stitches. 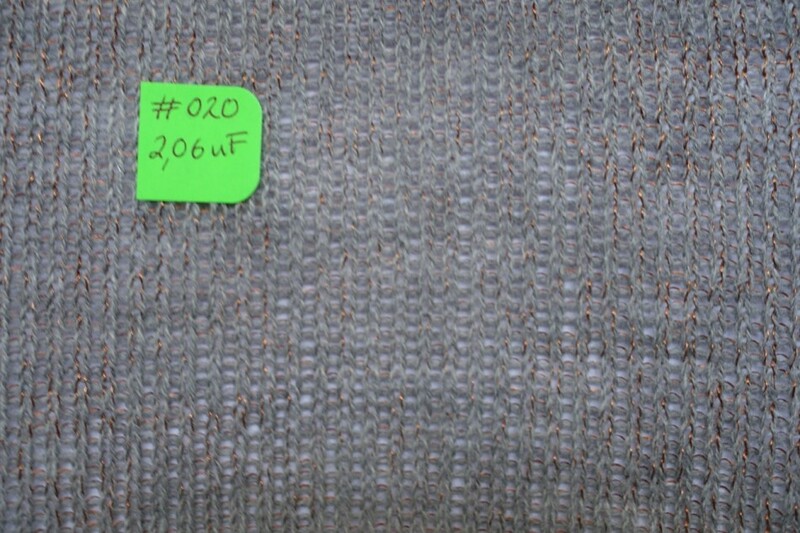 The capacity of #20 is higher, probably because through the extra thread the wires are knitted closer together. Trying using other material and various tensions to minimize the isolation between the wires. There is no significant difference in the capacity between the variable tensions. 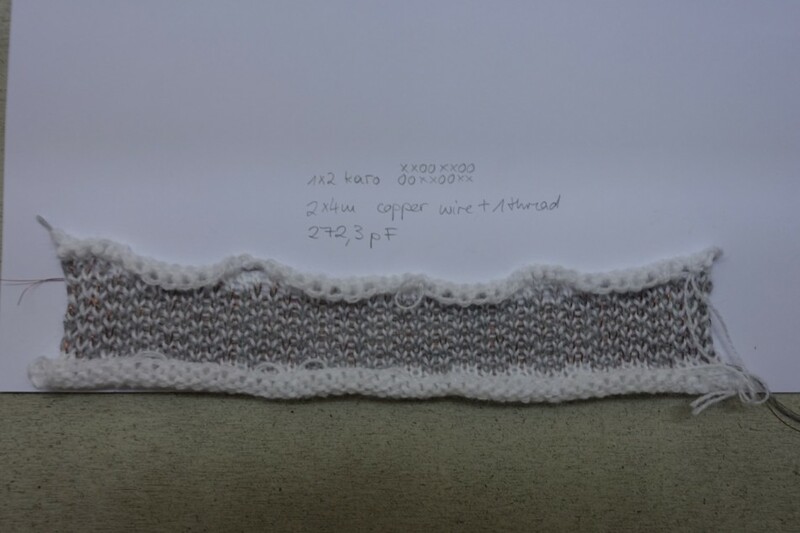 Furthermore, comparing the silver thread and the copper wire, there is neither a significant difference in the capacity. 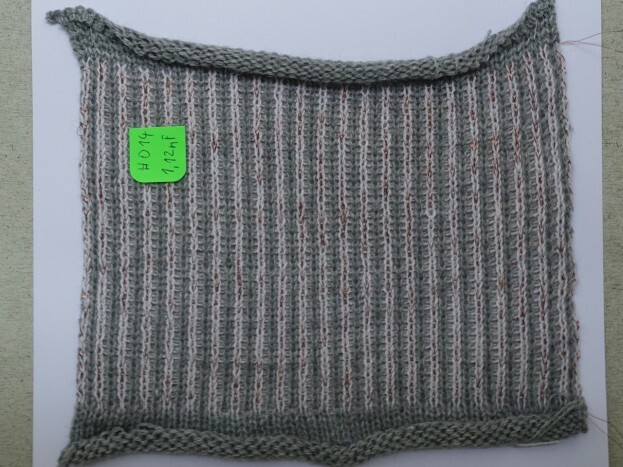 So knitting the wires tighter together has positive effects on the capacity values, but just to a certain extent. Higher tension causes more curves in the wires. As you can see in test 4, curves have a negative impact on capacity values. The more conductive material (like copper wire), the higher the capacity. The tighter the wires are knitted together, the less the isolation, the higher the capacity. The longer the lines of the wires in the pattern/ the less curves in the wire, the higher the capacity.